It was fascinating to watch the dynamic of the site today – half-way through week three and everything is flowing like a well-oiled machine. Everyone knows exactly what to do. Young diggers move with purpose and confidence and the immense reams of paper recording, which are so necessary to the understanding of the site in post-excavation, are filled in smoothly and accurately, and with almost no head-scratching. Interesting finds were, however, a little more scarce than usual. In Structure Eight, Ray discovered a pillow-shaped stone, with nicely finished ends, which has also been ground to a glass-like surface. It is an enigmatic object, although not wholly unknown on Neolithic sites, but yet another sign of the rich nature of the artefacts in this large and complicated structure. In Structure Fourteen, which is in Hugo’s northern corner, Vince has worked hard in what can only be called an area of confusion – especially as much of it seems to show use and re-use of the material. However, as yesterday afternoon drew on, it seems likely that he has found part of the end walling. If so, and it will be clearer tomorrow, this will be a useful advance in understanding the somewhat chaotic nature of the structures here. Moving away from the northern end of Structure Eight, where many of the more exotic finds have been discovered, work is progressing in uncovering the remaining half of the building. This involves removing the midden tips and infill that still blanket substantial portions. Of crucial interest is the survival of the elusive south end. Is it intact? We will know soon. But it is already clear that the south-east corner was badly robbed out when Structure Ten was built. Over in Structure Ten, in Claire’s corner – the potential paint workshop – it is becoming clear that the outline of the walls and structures is a good deal more complicated than previously thought. There appears to be a whole sequence of re-alignment of the walls in this area, together with indications of a series of flagged floors. Similarly, in other parts of the interior of Structure Ten there are signs emerging of several different phases of use. If this is confirmed, it may suggest that Structure Ten was in use for a significant time – perhaps longer than had been originally thought. In Structure Twelve, a puzzle has emerged. The south-eastern wall has, as was already known, been robbed of many of its stones in antiquity. Luckily, a reasonable proportion of it remains, and here lies the puzzle. Any sane stone-robber should take the best stones he can find, but the robbers of Structure Twelve have left some amazingly good building stone behind. Either they only wanted a small amount – which seems unlikely – or perhaps they just didn’t recognise the stone riches in front of them. Or was this a deliberate act to decommission the structure? Whatever the reason, we can be glad they left much of it alone. The MAAP students from Orkney College, UHI, have been busy surveying Mr and Mrs Tait’s barn as part of their surveying module. A handsome, although unremarkable structure, the barn will soon be the best surveyed building in Orkney. 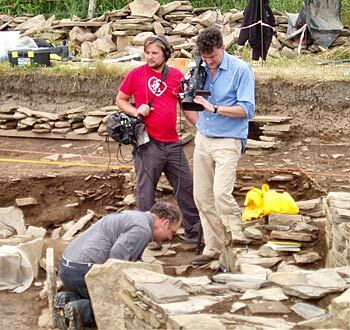 The BBC also returned today – just a team of two, cameraman/producer Simon and his soundman Sam – for a few days doing interviews and recording some of the action and new discoveries. Later in the month, the frontman of A History of Ancient Britain, Neil Oliver, will again return to the Ness for some additional filming before the programme is aired, hopefully sometime later this year. 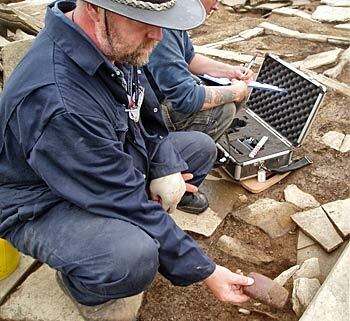 I’m from Milngavie, Glasgow and I’m currently undertaking my PhD at Durham University on the nature of Mesolithic-Neolithic plant use in Scotland. 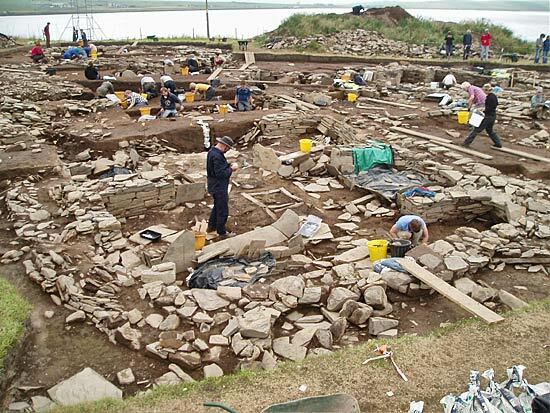 I first visited the Ness of Brodgar two years ago, during a trip to Orkney to process and collect samples from the Neolithic settlement at the Braes of Ha’breck, in Wyre, as part of my PhD research. 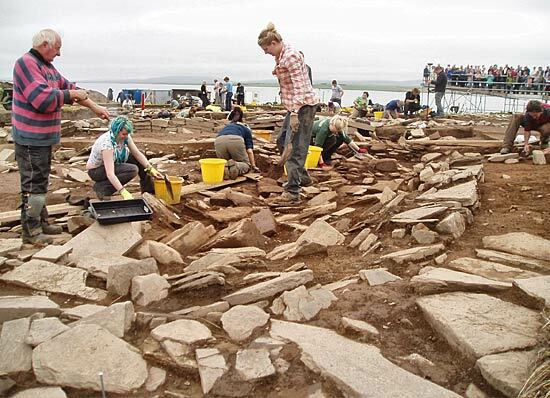 I was amazed at the scale and complexity of the structures on the Ness of Brodgar and it has been my ambition to dig at the site ever since then. This year, I have finally returned to excavate at the site, as part of a placement with ORCA. So far, I’ve been excitedly digging in Structure One, with its beautiful, well-constructed masonry, surviving to at least 13 courses. With most of the later material removed, we are now onto the floor deposits in the structure. Earlier in the week, I removed a later of rubble, which sealed the southern hearth, to reveal two of the hearth slabs. Incredibly, one of these slabs showed traces of red pigment and so it’s possible that this hearth may have been painted or used to grind pigment for use elsewhere in the building. 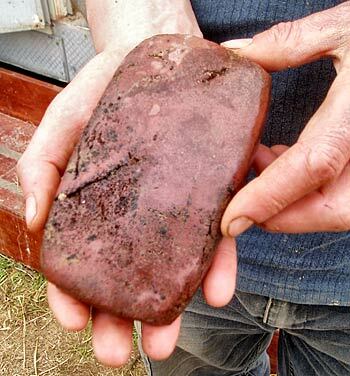 Similar traces of red pigment were also revealed on one of the slabs of the central hearth. The other side of the hearth is sealed by later material and so I have been working on this area of the trench today. I recorded and removed a compact layer of clay and rubble, which may have been a leveling layer for the curved walling that has now been removed. It’s really amazing to be actually digging in Neolithic floor deposits, the primary layers of occupation, which have the potential to contain a plethora of environmental and artefactual evidence.